It appears MAFS mania is well and truly alive, with season six generating more than six million social interactions across Twitter, Facebook and Instagram, a whopping 421 per cent increase on season five. Married At First Sight fans took to their second-screens as all the pivotal moments unfolded, with over 80 per cent of social interactions occurring while the program aired. 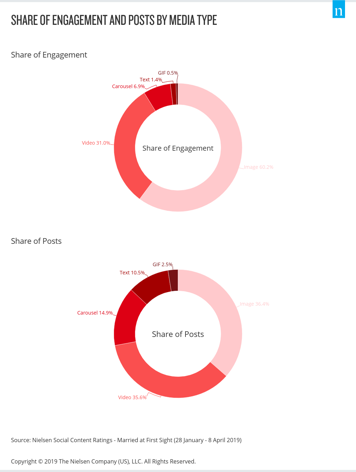 When looking at share of engagement across network, program and talent, over 62 per cent of social interactions was with MAFS talent accounts, which is more than double the share of engagement when comparing the average across other reality series programming for talent at 27 per cent. Nine’s group marketing director Karen Madden said: “We built a social strategy to enable our audience to interact and engage with the show and its participants on our official accounts as a true second screen experience. “Based on experience from previous years, we proactively worked in partnership with the show participants to curate their content ensuring we could deliver a safe environment by moderating and managing the huge amount of conversation happening across social. 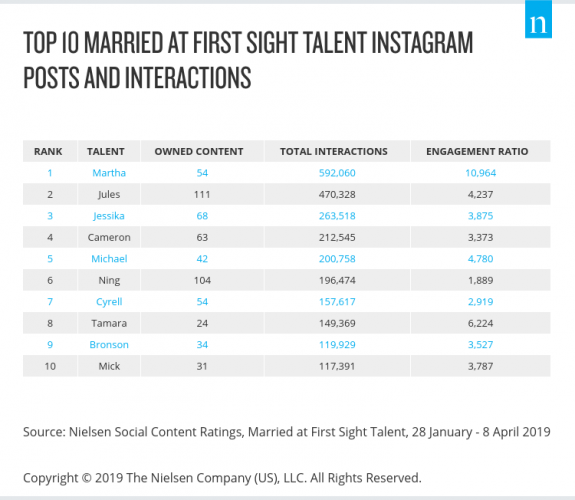 The below chart ranks the MAFS talent accounts based on total social interactions and highlights that fans couldn’t get enough of Martha, not only generating the most interactions, but also the highest engagement per post.